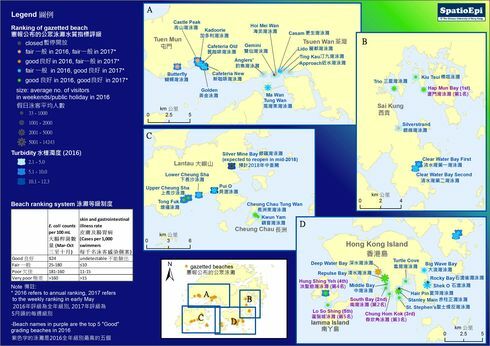 Data source: Agriculture, Fisheries and Conservation Department, Hong Kong Special Administrative Region Government. 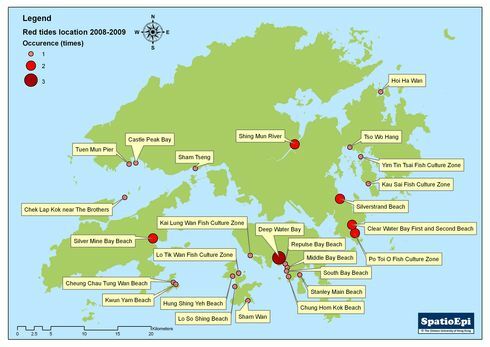 Map shows the distribution of reported red tides in Hong Kong between 21/11/2008 and 27/11/2009. The red circles represent the location of red tides. The larger and darker the circle, the higher the number of red tides reported in the location. During this one year period, Deep Water Bay reported the highest number of red tides in Hong Kong. Fortunately, none of these red tide events were linked with reported fish deaths. Red tides are caused by a rapid multiplication of tiny microscopic single-celled (unicellular) algae. The discolouration is due to the presence of pigment contained in the algae cells. The pigment can be red, pink, brown or in other colours. Most of the red tides are harmless. However, a number of algae species release toxins which can cause contamination of seafood, leading to fish deaths and may result in harmful effects on human. Such incidents are called "Harmful Algal Blooms" (HABs). Although most of the red tides are natural phenomenon, some are related to environmental pollution, such as inappropriate deposition of industrial waste and sewage.